Champion Sports presents you with a full complement of equipment to start and play a game of bocce ball anywhere. Designate the area you want to play in, make sure all the players know the rules of the game we’ve included with every set, and instantly begin rolling. Whether you're just learning the game, teaching the game to students or refining your aim, our kit has the perfect accessories to help get the job done. Roll bocce ball in bold green or red. Form teams with family and friends at your barbecue, or start a competition between visiting troops at summer camp. Each color is bright and bold to show up roll after roll. They're sure to be favorites with players of all ages. Whether you're training on soft grass in the back yard, textured asphalt driveways, coarse concrete sidewalks, or smooth finish alleys, each ball is hard formed to preserve the look and feel. Continue learning the game of bocce ball or or for hours of fun. Our bocce ball set lets everyone in on the fun. Invite family and friends over for games during the barbecue or party and split into teams of four, three, two, or simply play one on one. Ideal for school gym classes, rec centers, after school programs, camps, and more. 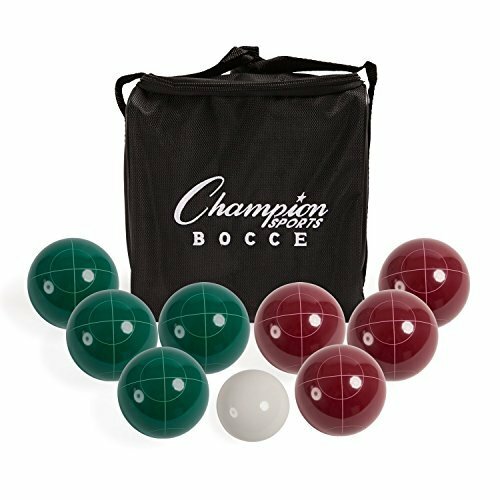 Champion Sports portable bocce ball kit includes a complimentary carrying bag to stow your set when traveling and to keep items together for convenient storage. Grab and go for games at your friends’ or relatives’ houses, enjoy quick setup for games, then stow everything in the bag and be on your way.